Finding a foundation is like looking for a needle in a haystack. There are so many claiming to do so many different things that it’s difficult to know where to begin. Whilst your perusing the drug store for a new foundation it’s important to remember that you probably already have a face of make-up on, so testing a new one over the top of a layer of base coat and powder isn’t going to give you a very realistic result, nether is testing it on your hand, nether is artificial shop lighting. Whatever you do (even if it means venturing to the make-up stands bare faced!) just be aware that it might look a little different when you get it home. However, a foundation that we really like and would recommend in terms of matte effect, last-ability, moisture, texture, presentation and price would have to be Maybelline’s latest offering. 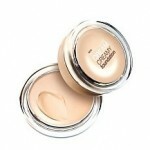 Following on from the success of Maybelline’s Dream Matte Mousse comes the even lighter Dream Creamy Foundation. It’s whipped cream like texture means it glides easily onto the skin with the enclosed sponge applicator. The foundation is designed for dry skin tones so for those of you with dry or sometimes flaky complexion this is fabulous as it keeps you hydrated throughout the day and doesn’t peel. The only down side is that most of the shades cater to those with lighter skin tones but this can be easily remedied by combining a little Dream Cream with a foundation which suits your complexion, or use the dream cream for the driest areas of your face such as your forehead and blend well into your regular foundation on the other areas.